My work will be apart of this exhibit. This was a most welcome surprise and I feel so honored to stand proud with Pittsburgh’s finest women achievers who have made significant contributions to our communities ….and to be represented such an important organization! Come Join Us and Create a Bus Billboard! 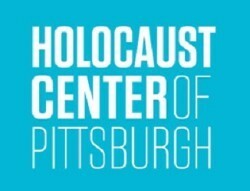 Gerry Florida /Florida Recycled and Shuman Juvenile Detention Center have partnered with Pittsburgh Center for Creative Reuse to launch its first “Open Community” bus billboard campaign that will be seen traveling the Pittsburgh area on the rear of a Port Authority bus in the summer of 2018. See your artistry on the back of a port authority bus! If You have not seen the complete Calendar of the twelve Port Authority billboards created through Gerry Florida/ Florida Recycled at Shuman Juvenile Detention Center you can get your free download on the Allegheny County website. Gerry Florida/Florida Recycled has partner with Construction Junction to open a second studio “Shuman Studio Blue at Construction Junction” where released residents can serve their sentenced community service time with Ms. Florida. Working with the courts the studio is now a community service site. Look for the upcoming announcement! Stop by and visit Studio Blue at Construction Junction meet my talented crew of painters! in the UPMC Children’s Hospital Parking lot off of 55th and Butler. Stop by the Construction Junction booth and see some of the functional furniture handywork that will be part of the Construction Junction display! Gina's included in 23rd Annual ARTS IN HARMONY International in Minneapolis, Minnesota, 2/15-3/16, and possibly its accompanying travel exhibits through June, and also in the WEBSTER ARTS OPEN JURIED International Exhibition in St. Louis, MO which accepted two watercolors. For this latter show, 45 artworks from 37 artists were accepted from 407 entries from 105 artists. Gina Judy was in the Kentucky Watercolor Society National Show, where she recently attended the opening in Louisville in November '17. She was also in the VERUM ULTIMUM Art Gallery Show " A Generous Kingdom II", in Portland, OR. Finally, Summit Art Gallery, Main St., Weirton, WV through Mar. 23, 2018 includes two second-place in category awards out of three entries, done 10 days (!!) prior to show deadline; also hung the show, helped write the prospectus, and created a hardbound catalog show-commemorative book. Mary started a Youtube channel where she is teaching acrylic painting, as well as future possibilities in mediums of oil and pastel. Tune in at Pittsburgh Artist Studio. The lessons are free. Karen Larson has a few pieces being shown for the 15 minutes of fame video exhibit at 5900 Penn Ave (Beatty St. side). On Jan 6th at 7 pm. Fin is being shown. Others shown were: Shell Wreath, & Pumpkin in the Beets. The show, entitled "NEW HORIZONS : Landscapes in Oil by Bob Bickers" will take place December 1-30, 2017 at the Monroeville Public Library, 4000 Gateway Campus Blvd., Monroeville, PA 15146, by the Gateway School. An Opening Reception will be held on Saturday, December 9th, 6:00-8:00pm and the public is invited. A portion from the sale of artwork benefits the volunteer group, Friends of the Monroeville Public Library. Gallery hours during the exhibition are: 9:00am-9:00pm Monday-Thursday; 9:00am-5:00pm Friday & Saturday; and 12:00pm-3:00pm Sunday. The Library and Gallery will be closed on December 23rd, 24th 25th, 31st and January 1st. Directions to the Monroeville Public Library: Take Parkway Exit 84A or Turnpike Exit 57 or Route 22 to Monroeville, go south on Route 48 (Mosside Boulevard). Turn right at the 4th light onto Gateway Campus Boulevard. Then turn left at stop sign to library. Bob Bickers is an artist living and working from his home and studio in Murrysville, Pennsylvania, where he has created art in oils and acrylics for many years. The bulk of this show’s paintings are new landscapes and have never been on public display before, hence the show’s title, “NEW HORIZONS”. Having recently retired from the practice of law, the show also represents Bob’s new explorations as a full-time artist. More about Bob Bickers can be found at his website, http://www.bobbickers.net and his art blog, http://fineartbybobbickers.blogspot.com. The Annual Christmas Extravaganza Sale will be held on December 2, 2017 at our gallery located at 428 Alta Vista Rd., Natrona Heights, from 10 AM to 2 PM. Seats are limited so you will want to register early. Go to www.greensburgartcenter.org to fill out the registration form and pay your $60** to reserve your seat. After registering, you will receive an email containing a supply list and directions to pay the remaining $300. We created a permanent art installation for the Holocaust Center using the butterflies which were painted by community members. 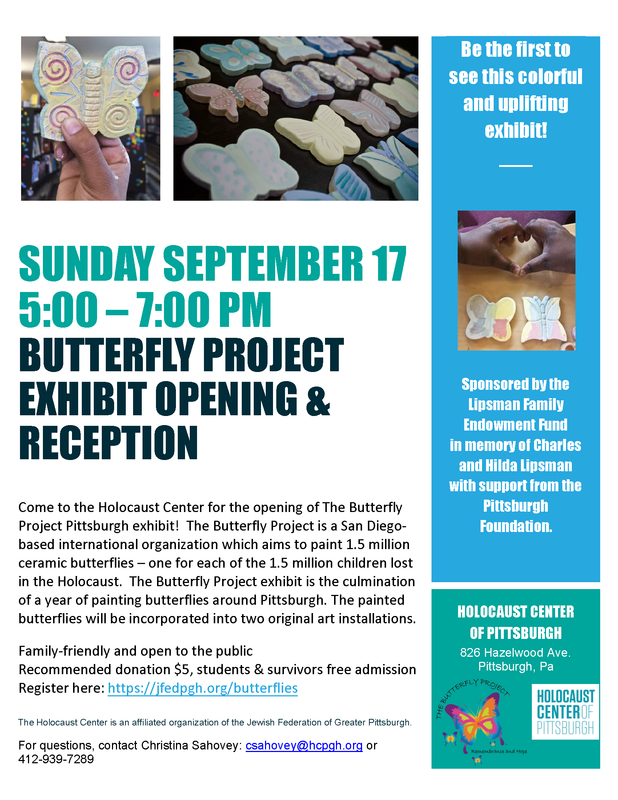 Sunday, September 17 - The Butterfly Project Exhibition opens at the Holocaust Center of Pittsburgh, ushering in our annual theme of Children in the Holocaust. The exhibit includes two original art installations and 800 butterflies painted across the region over the past year, each remembering one child lost in the Holocaust. The Butterfly Project was inspired by art created by children in the Theresienstadt Ghetto. Our event will feature guest speaker Hana Kovanic, a survivor of Theresienstadt. Doors open at 5:00; Program begins at 5:30.